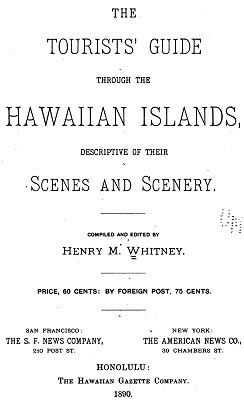 Henry H. Whitney : Tourist Guide to Hawaii, 1890. 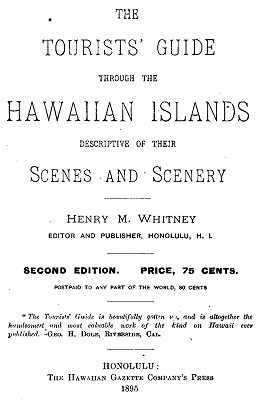 The Tourists' Guide through the Hawaiian Islands, Descriptive of Their Scenes and Scenery. The book includes 2 foldout maps, not available in the online edition. Whitney self-published, what was probaly the first, Hawaiian guide book in 1875, appropirately titled The Hawaiian Guide Book. Presumably, this provided a template for the Tourists' Guide of 1890, followed by a second edition in 1895. On page 5, the guide identifies Mr. H. Johnson as the proprietor of the Hamilton Hotel in Honolulu, "connected with it is a seaside cottage at Waikiki." By October 1891, Johnson was manager of the Hawaiian Hotel, also in Honolulu, and around this period it was re-named the Royal Hawaiian Hotel. being unsurpassed on the Island." Known as Waikiki Villa since 1889, the new venture was re-named the Hotel Park Annex. Howard Johnson, with Charles. H. Ritchie, later moved to California where they opened the La Jolla Park Hotel in January 1893, and that summer the management employed a native of Kona, Hawaii, John Ahia, to give "surf riding shows." The rare image of Hilo from offshore, facing page 48, shows "Coconut Island" in the right foreground, said to be a recognised surf break. Hilo Bay was enclosed by a harbour breakwater between 1908 and 1929, severely restricting Hilo's surfing resources. Athough the quality of surf-bathing at Waikiki is noted, there is no mention of surfriding in the text. 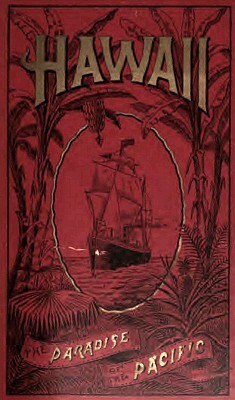 However there is a colour illustration inside the back cover in an advertisement for the oceanic Steamship company. "THE HAMILTON" is centrally located on King street, near Fort street, in the heart of the business portion of the city. Its proprietor, Mr. H. Johnson, has recently fitted it up for the comfort and accommodation of his guests, regardless of expense, and guests will find it a pleasant and desirable family home. 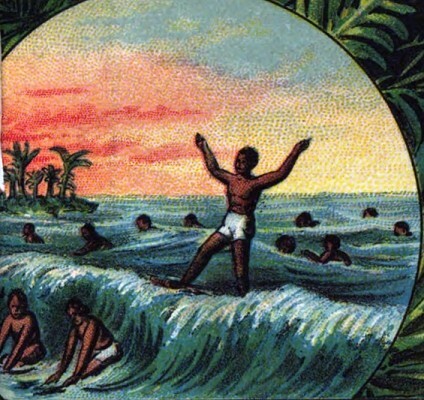 It was here, with the inspiration of such a scene, and under the shade of the tall coco trees, that the picture of Hilo which adorns the opposite page was conceived and sketched by the writer, and afterwards copied and finished with artistic skill by Hawaii's young artist, Mr. D. Howard Hitchcock, on whom the mantle of the lamented Tavernier seems to have unconsciously fallen. It is a panoramic sketch which every tourist will recognize and prize as a faithful bird's-eye view of the most charming scene in this earthly paradise. WAIKIKI is the seaside resort of Honolulu, its Long Branch, its Brighton or its Trouville. There are a number of private roKldoneoii, picturesque-looking bungalows, unpretentious cottages, but all very airy and comfortable, close to the murmuring sea. A very fine cocoanut grove is one of the features of the place. The southern portion of this used to he a favorite abode of the Kings of Oahu, before the conquest, and since then has belonged to the Kamehamoha family. jlornlc' I'liiiahl Mlshop, the last of the Kamehameha family. The sea bathing is simply perfection. water is never chilly ; and yet it is most healthful and invigorating. The bottom is of nice smooth sand, always warm and pleasant to the feet. There is no fear of undertow or of any finny monsters. Not only is it pleasant to bathe here during the day, but moonlight bathing is indulged in. This is really charming, and anyone who has not experienced its delights, has a joy to count, be he never so blaze. A toboggan slide has been added to the attractions of the place. Let the visitor go down and try it. It is a novelty, worth seeing, if not trying. A little beyond the Long Branch Baths, on the left hand side of the road, is the marine residence of King Kalakaua. It is a simple, unpretending, wooden structure, standing in a large lot planted with cocoanut trees. Behind it is the residence of the Hon. A. S. Cleghorn, father of the Princess Kaiulani. This is one of the most charming of private residences. Thoroughly tropical in character, and standing amid grounds crowded with rare and costly trees, shrubs and plants. A third approach to the park will be by the Ocean Avenue, now being constructed from the harbor to Waikiki, along the seashore. Quite a number of fine residences have been erected, stretchng from the entrance along the shore to the foot of Diamond Head, and thence following the road beyond the track past the Casino residence of H. J. Nolte. On the main avenue are some fine residences, including those of Allan Herbert, Hon. W. G. Irwin, the Park Hotel and James Campbell, near the base of Diamond Head. These and other residences are provided with ample fresh water from artesian wells in the neighborhood. The bathing facilities along the Waikiki beach, both within and without the park, are very superior, and are much resorted to by citizens and strangers. The sea-water possesses a pleasant temperature, and for most people is a healthy and invigorating tonic. Waikiki has been for a century and is still the favorite abode of the Hawaiian chiefs, who have their preserves under the cool shade of the cocoanut palms, which constitute one of the most charming groves to be found in any country. Descriptive of Their Scenes and Scenery. 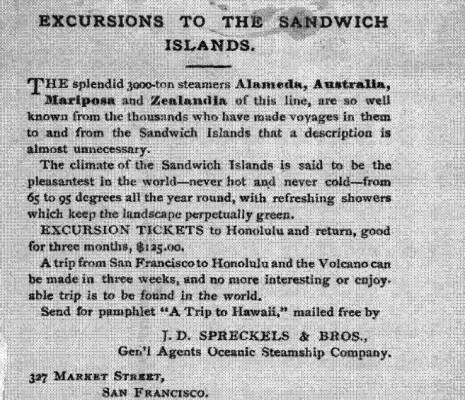 The Hawaiian Gazette Co., Honolulu,1895. 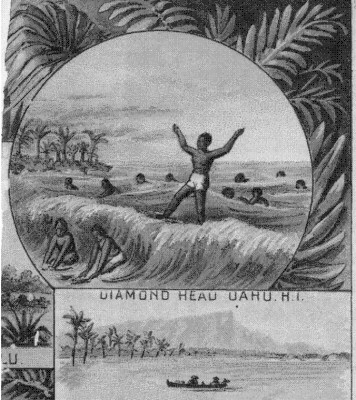 Geoff Cater (2012) : Henry M. Whitney : Tourist Guide to Hawaii, 1890.